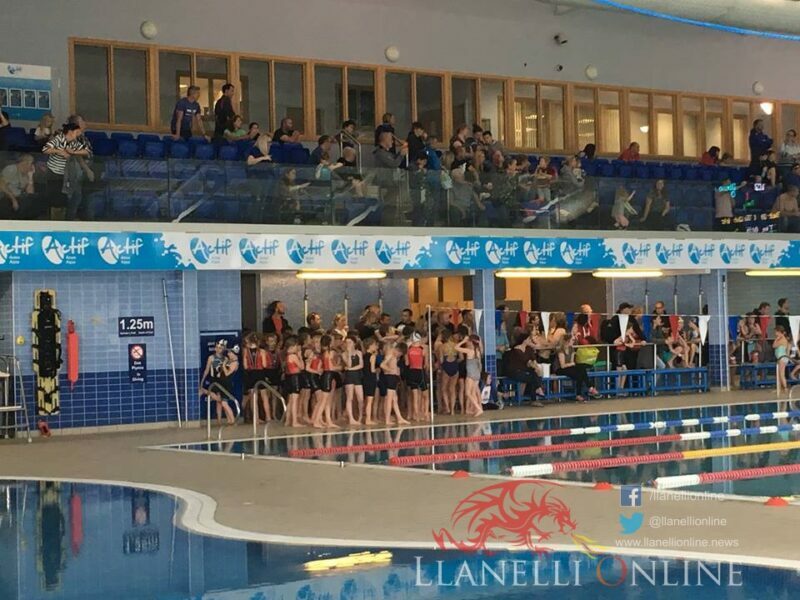 IT was an action-packed few days of competition on the grounds of Carmarthen Leisure Centre over the weekend of Saturday and Sunday (Oct 6 – 7). 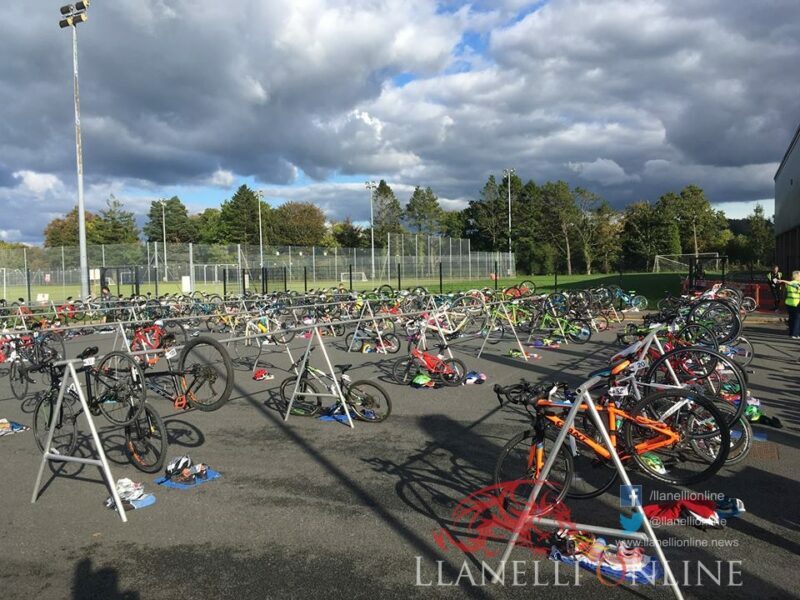 Two well established Triathlon events returned to Carmarthen which concluded the season as far as Triathletes were concerned. Almost 350 people aged from eight up to seventy-four participated throughout the weekend with a large number of them taking part in the sport for the very first time. Victoria Prenderville Sport and Exercise Performance Dietitian and Cycle Specific were on board as the event sponsors. 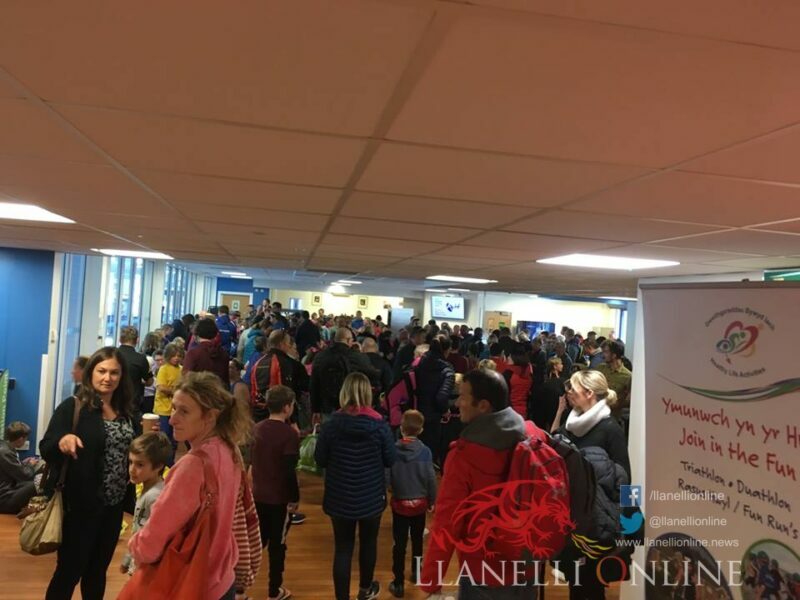 These end of season events were both organised by Noelwyn and Sharon Daniel at Healthy Life Activities, who continue to do a great amount of work providing these safe and healthy events for children and adults each year. 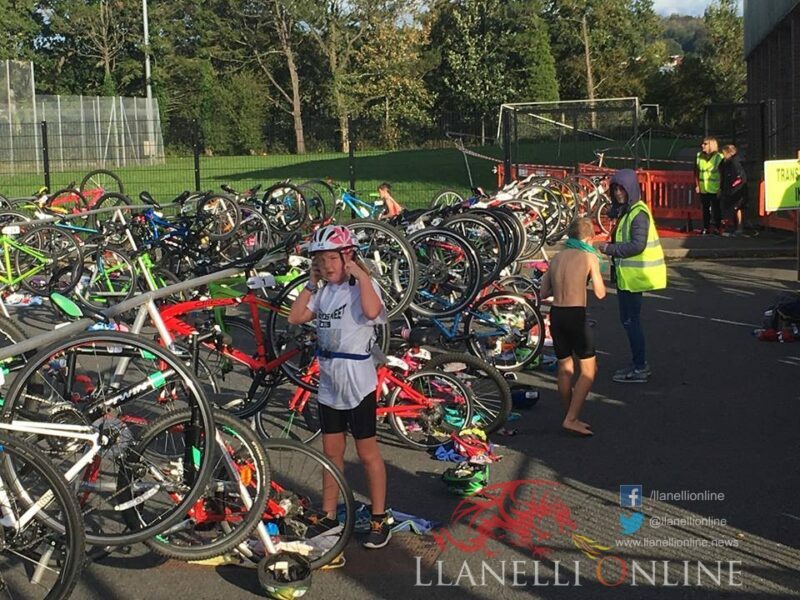 It all got underway at teatime on Saturday 6th October as attention turned to the youngsters aged between 8 and 14 years-old in the Carmarthen Myrddin Junior Triathlon. After a rather wet start to the day, it soon cleared up by lunchtime and attracted another great turnout of athletes and spectators alike for the final event of the year. It gave youngsters aged 8 to 14–years-old the opportunity to take part in a friendly triathlon. All athletes were given race numbers to make them look like professionals – including a timing chip, wrist band and tattoo. There were four age groups open to children including the Tristar S for 8-year-olds, Tristar 1 for 9/10-year-olds, Tristar 2 for 11/12-year-olds and Tristar 3 for the experienced 13/14-year-olds. 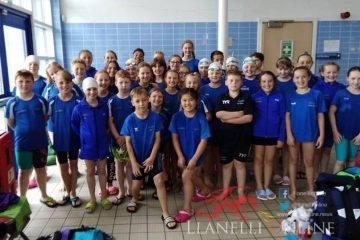 Following a quick brief for all athletes and parents from the organiser, it was the young 8-year-olds (many competing at any event for the first time ever) who were the first to set off at around 4.10pm on a pleasant Saturday afternoon around the Carmarthen Leisure Centre grounds. The eight-lane swimming pool was the first step of the course as the children went off at different waves, completing 50m, 150m, 200m or 300m. 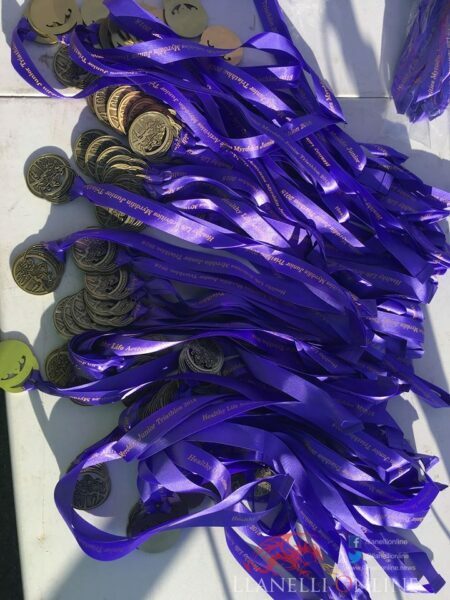 After running round to transition which was located near the Astroturf, they picked up their bikes and completed the required number of loops around the QE High Secondary School totalling either 900m, 1.8km, 2.7km or 3.6km. On return to transition, the run was the final part to do. 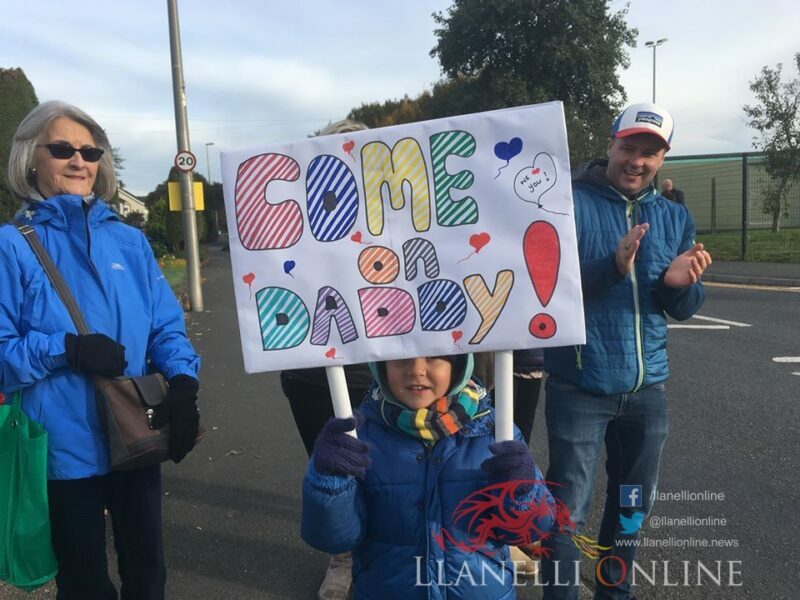 This took place on the Carmarthen Harriers Athletics Track and after completing the one, two, three or four laps, there was a grand stand finish outside the Leisure Centre building. All 150 spaces were taken in quick time again this year and the competitors were supported by their friends and family who turned out in their numbers to this junior event in Johnstown. 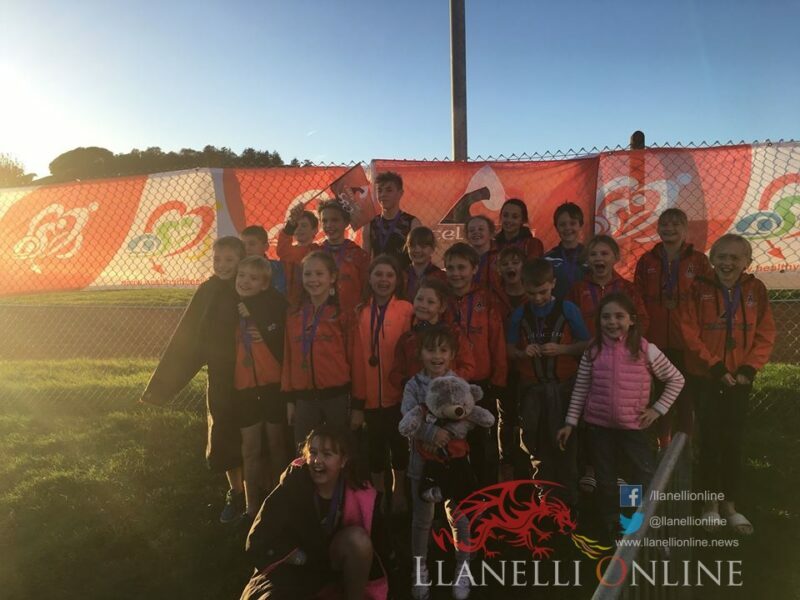 As a well done, all finishers of the Myrddin Junior Triathlon were presented with a medal along with some sweets. In addition, this race had trophies up for grabs for the top three in each age group. They were presented by Victoria Prenderville. 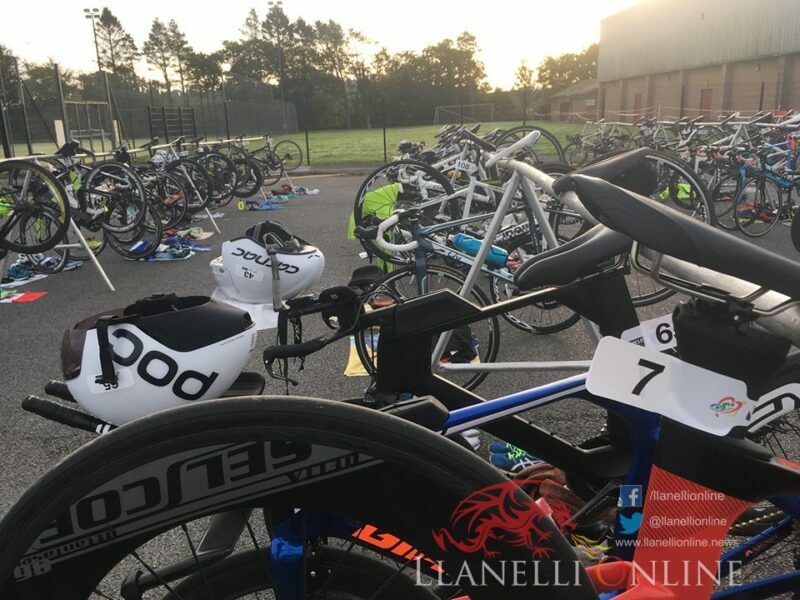 Before daylight even arrived early on Sunday and not long after the kids were at the location, there were senior triathletes having already begun their journeys at the Carmarthen Sprint Triathlon on a very chilly Sunday morning. 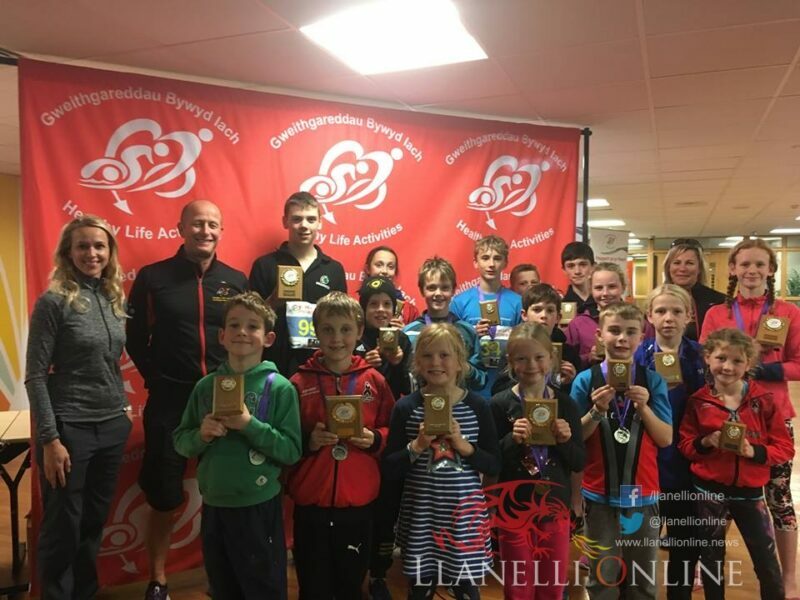 It was an early start for the novice and experienced triathletes who had travelled from across South Wales and beyond as the final triathlon series fixture of the year was back at Carmarthen Leisure Centre. 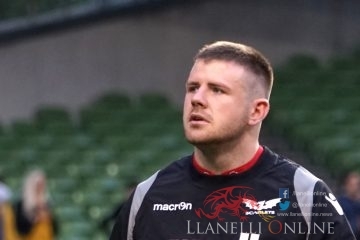 The event brought the 2018 series to an end after an exciting few months of competition across Carmarthenshire, including at venues such as Burry Port, Carmarthen and Ammanford. 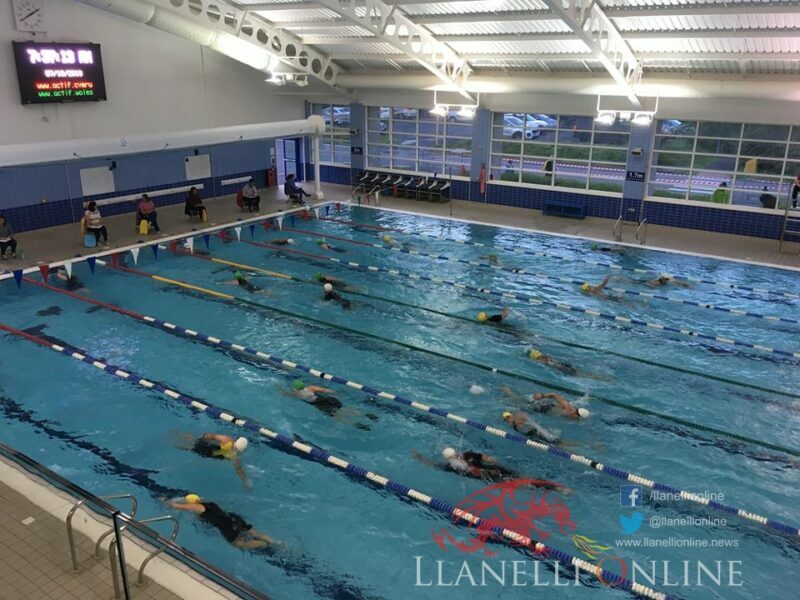 The Carmarthen Sprint Triathlon started at 7.30am with the first set of swimmers, continuing through in the pool until after 9.00am. 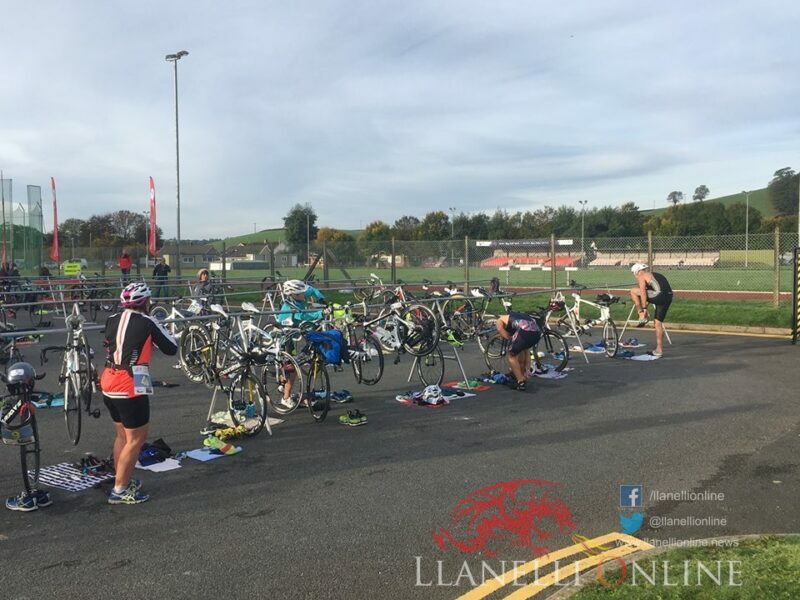 The course for competitors taking part included a 400m swim first before biking their way down the main road to Llansteffan and back totalling 23km. 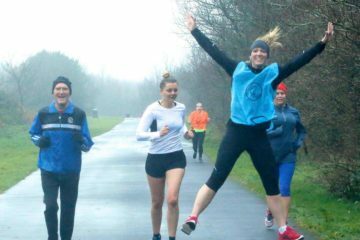 On returning from Llansteffan, it was then a 5km run along the Tywi river and a lap around the Carmarthen Harriers Athletics Track. It was an out and back course with a grand stand finish back at the Leisure Centre. More than 160 athletes finished the race with trophies up for grabs for the category winners. They were presented by former athlete and a great supporter of these local events, Phillip Turner from Cycle Specific. The overall male and female series titles went to Richard Wilder (Ufit Tri) and Mary Lewis (Celtic Tri). 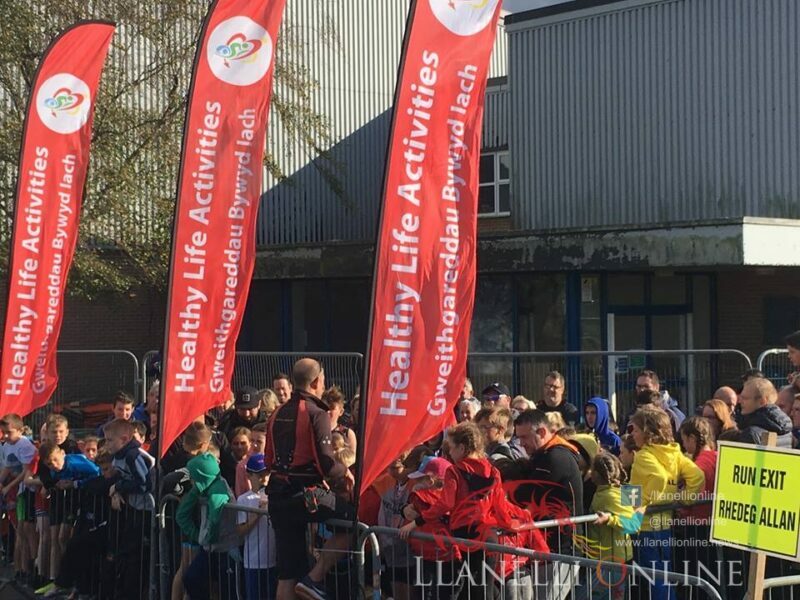 2019 will see big events return with Healthy Life Activities from April onwards starting with the Amman Valley Sprint Triathlon at Ammanford Leisure Centre. 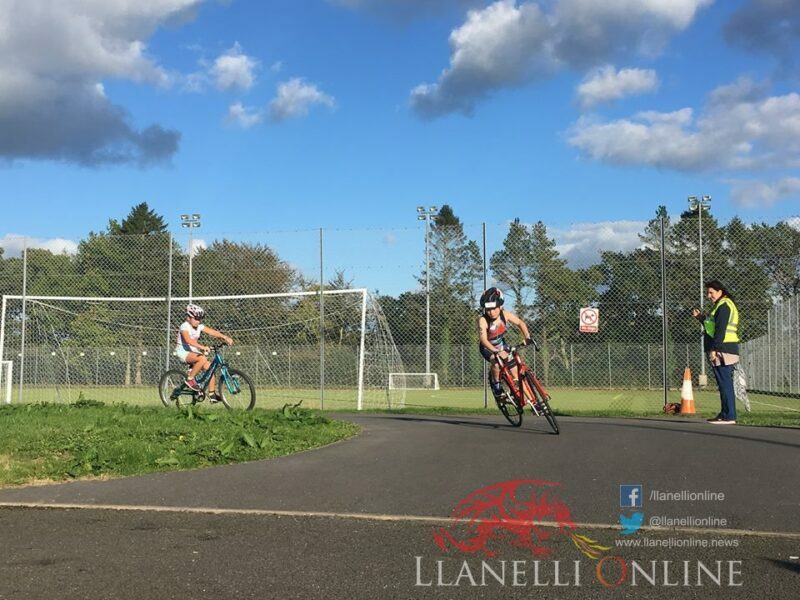 Carmarthen Junior Fun Triathlon and Llanelli Junior Duathlon also returns for youngsters with the annual favourites open for adults at Carmarthen and Burry Port. 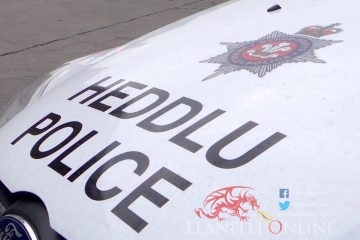 Congratulations – Llongyfarchiadau to all those who took part and thanks from the organisers to all the marshals and volunteers from a number of clubs and organisations who helped out during the two events.